Currently, cooperation in diamonds is largely carried between the two countries via European agents. India supports enhancement of direct contacts between Russian and Indian diamond companies that will help avoid European middlemen, said Russia's Trade Representative to India, Yaroslav Tarasyuk. Currently, cooperation in diamonds is largely carried between the two countries via European agents, especially through Belgium. According to statistics for 2013, Russian diamond company Alrosa achieved the production worth over US$700 million working with Indian enterprises, Tarasyuk told RIA Novosti in an interview. However, Belgian companies, working only with Indian sources, purchased rough diamonds worth more than US$1.25 billion. "The Indian government supports the increase in direct contacts between Russian and Indian diamond companies as, at the end of the day, a significant percentage of the diamonds sent to Belgium end up going to India for enhancement" he observed. He believes that Alrosa is most likely going to continue choosing Indian partners for direct deliveries to India. As part of the World Diamond Conference in New Delhi on December 11-12 2014, Alrosa signed long-term agreements with three new diamond companies from India, increasing their number to 12. India is the world’s largest centre for processing diamonds, with more than 70 percent of the world’s extracted diamonds sent there for cutting. Alrosa carries out surveying, diamond mining, processing and sales. It is one of the largest diamond carat producers in the world. Mining operations of the company are run in Yakutia and Arkhangelsk regions. 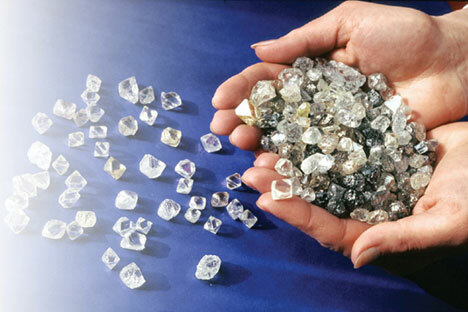 In 2013 Alrosa mined 36.9 million carats of rough diamonds. The Alrosa Group’s profit, according to IFRS reports for the last year, dropped by five percent to 31.8 billion rubles.